DISCcert’s next 2 day DISC Certification program on the West Coast has been scheduled to take place June 4th and 5th in San Diego, California. HR professionals, corporate trainers, and coaches, who would like to add DISC to their training portfolio, are encouraged to register for this nationally recognized class taught by author and master DISC Certification expert, Bonnie Burn. Our March 2015 – DISC Certification Class on the West Coast will help trainers teach staff members better communication skills. DISCcert, has announced its next two day DISC Certification on the West Coast to take place Jun 4th and 5th in San Diego. Corporate trainers, HR professionals and coaches will gather together to attend DISCcert’s comprehensive and highly regarded program. Each participant will be provided with resources and other tools that they can effectively implement into their training portfolio. The two-day class is designed to equip trainers and coaches with training techniques to immerse employees, staff or individuals in DISC. Trainers are also supplied with learning activities, PowerPoint presentations and lesson plans to integrate into coaching, training, and organizational development. The company’s objective is to enable training professionals to teach DISC to key members of their organization with confidence. DISCcert’s training program is interactive as well as supportive. Classroom attendees are encouraged to work cooperatively to problem solve scenarios that are typically encountered in a company environment. The will utilize role playing, and specific exercises to build a positive and productive culture within their company. DISC training has been proven to be effective for team building, executive coaching, management skills, conflict resolution, and sales training. Companies also use DISC as a catalyst for conflict resolution, change management, customer service, on-boarding and performance development. DISCcert offers three options for a comprehensive DISC certification program: the two-day classroom format, the in-house program and now the four-part webinar series. All three options enable organizations to save money by capitalizing on their internal training talent. The past and present financial stress has caused many organizations to reduce their training budgets and search out options for capitalizing on their in-house human resource expertise. Becoming DISC certified through DISCcert has been the choice of organizations nationwide. 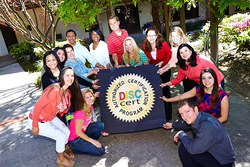 DISC certified graduates who have taken the DISCcert program, quickly learn how to use the most practical DISC training tools for optimum results. As a result, trainers are able to successfully launch DISC at their organizations, as well as easily implement a reinforcement strategy to ensure ongoing positive progress and development. Bonnie Burn is a 30-year master corporate trainer and author of Assessment A to Z, Jossey-Bass Publishing. Her expertise as a professional DISC expert and corporate trainer have led her to design the most up-to-date and comprehensive DISC Certification Program available. Through her company, DISCcert, business trainers and HR training professionals can easily gain confidence in knowing how to successfully teach DISC throughout their entire organization. Burn is committed to ensuring that all DISC trainers and HR professionals are successful with their training in the short and long term. Here is a sampling of what one graduate is saying: “At the end of the program you will feel confident and prepared to effectively use the tool to coach and develop employees at all levels.” Others can be found at Success Stories. She has trained over 420,000 people in corporate, government and non-profit organizations. DISCcert offers one of the nation’s leading DISC certification programs with three options for becoming DISC certified: a classroom program, an in-house session, and a live webinar format. Burn envisioned a DISC training resource company that provided practical coaching for trainers prior to, during and after the achievement of DISC certification. The sessions are positive, engaging, empowering and an ongoing learning experience. The professionally-prepared PowerPoint presentations, lesson plans, leader’s guides, and learning activities are designed so that each company or organization can customize them to fit their specific needs. In addition, DISC certified graduates receive 24/7 access to more than 200 DISC training resources, LinkedIn DISCcert Trainers’ Group and automated weekly DISC Tips.